Electric Pedals worked with four a-levels students at Hurtwood House deep in the Surrey countryside to make a music video as a part of their A-Level media course. 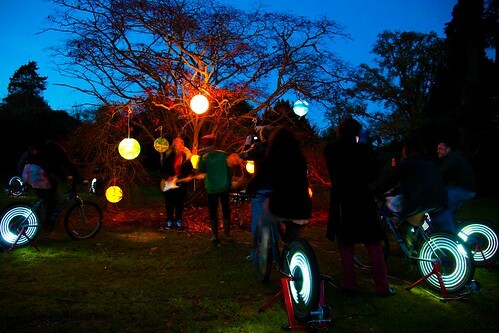 Having seen one of our installations at the Big Chill this year, the girls hit on the brilliant idea of having pedal-lanterns as a part of the climax for the performance. The lanterns we designed specially by the girls before the event and looked great. The entire event was also filmed by a friend of ours Claudia Lee and will be entered in a film makers competition called 'It's good to know ... a film competition' which is a quest to find surprising stories about good in the world. We look forward to seeing the final music video made by the girls and Claudia's submission.